Why does my reputation decrease when I downvote an invalid answer? Does it mean whenever I down vote someone's answer my reputation decreases even though I was doing nothing wrong except helping out the community? I took a screenshot of the event. Link to the topic : Why is my Samsung Galaxy S not utilizing all of its RAM? The second answer was totally unrelated to the question, hence I downvoted it. As you can see, I was not even a part of the conversation or thread. Am I misunderstanding something? Yes, your reputation decreases when you downvote an answer, but only by a small amount. Downvotes on questions, however, have no cost associated with them (though they did previously). Click on the arrow beside the What is reputation? topic in the site's FAQ for details on which actions give (and take away) reputation. This is done to make people think seriously about downvoting anything. Any positive action you do will get you at least five times as many reputation as you lost on that downvote, so it's really not worth worrying about too much. The net effect is that you have to feel very strongly about something to downvote it. Downvotes are serious business, and not to be cast lightly. We designed our system around that maxim. In circumstances where an answer is totally unrelated, or is spam, or really shouldn't be there for any reason you can click the "Flag" link to let a moderator know what you think. If a moderator agrees with you and deletes the post, then you may get your rep points refunded. More on flagging here Improved Flagging, including the side-effects of over-using the Flag option. Not the answer you're looking for? 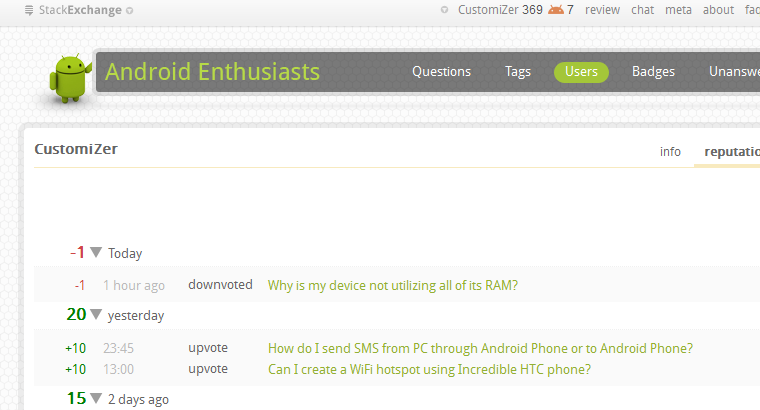 Browse other questions tagged support reputation voting .